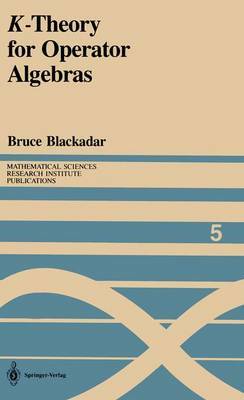 K -Theory has revolutionized the study of operator algebras in the last few years. As the primary component of the subject of "noncommutative topol- ogy," K -theory has opened vast new vistas within the structure theory of C*- algebras, as well as leading to profound and unexpected applications of opera- tor algebras to problems in geometry and topology. As a result, many topolo- gists and operator algebraists have feverishly begun trying to learn each others' subjects, and it appears certain that these two branches of mathematics have become deeply and permanently intertwined. Despite the fact that the whole subject is only about a decade old, operator K -theory has now reached a state of relative stability. While there will undoubtedly be many more revolutionary developments and applications in the future, it appears the basic theory has more or less reached a "final form." But because of the newness of the theory, there has so far been no comprehensive treatment of the subject. It is the ambitious goal of these notes to fill this gap. We will develop the K -theory of Banach algebras, the theory of extensions of C*-algebras, and the operator K -theory of Kasparov from scratch to its most advanced aspects. We will not treat applications in detail; however, we will outline the most striking of the applications to date in a section at the end, as well as mentioning others at suitable points in the text.